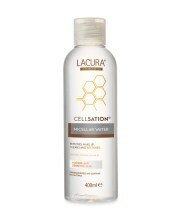 Lacura (Aldi) have brought out another limited edition skincare range, and the Cellsation range is aimed at mature skins, but as I don’t believe in ageism, it’s suited more to dry and fragile skins. It contains B5 which nourishes the skin and helps stimulate cell renewal, which leads to healthy and younger looking skin. The range consists of two cleansers, and a day and a night cream, all priced under £7 which makes them excellent value for the quality. The micellar water is a generous 400 ml bottle priced at £1.99 which is great value compared to similar products, and also is available as a triple pack. Although I’m not a huge fan of micellar water, it is very useful for removing makeup when you are in a hurry, or if you don’t have access to water (such as camping trips). It’s also alcohol free and removes waterproof mascara. A great product to use if you don’t like cleansing oils or creams to remove your makeup. The face wipes come in a pack of 25 and are priced at £1.29, but also come as a triple pack. I tried these and the wipe is sturdy and thick, and is generously saturated with cleanser, but does have quite a heavy scent. I was pleasantly surprised at how well it cleansed, and the wipe was tough as I put it through its paces. My skin was left smooth and clean, and softer than how it usually feels after using a facial wipe. *Both cleansers are really for makeup removal or for quick cleanses, so do follow up with a wash off cleanser after using either product for thorough cleansing. The day cream contains SPF15 which is the minimum the skin should wear these days. Remember to extend down to the neck area and décolleté for full protection. The cream helps to prevent sun damage, and to reduce the appearance of fine lines, and comes in a 50 ml jar priced at £6.99. This is ideal for people who have dry and sensitive skin, and for those who forget to use a sunscreen. While it’s not a replacement for using sunscreen, it’s gives some protection, so is fine for going out shopping, or going out for lunch. During summer time it’s a good idea to use a SPF30 at least if you are going to be outside walking or doing other activities. The night cream also comes in a 50 ml jar priced at £6.99 and contains an active ingredient called Celligent that helps promote skin renewal. The range is available online for pre-order now and in stores from 11 February while stocks last. These are ideal gifts for mothers or grandmothers for the upcoming Mother’s Day.